August | 2012 | ohdenny. Lemons. So useful in so many ways, a good cold remedy but also enjoyable as a refreshing drink or in sweets. 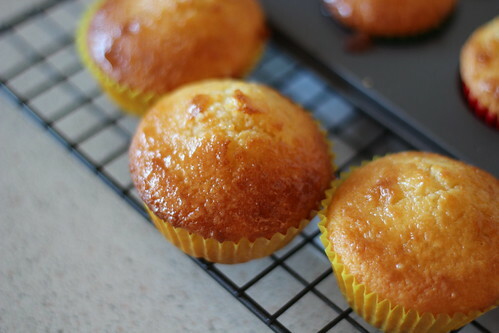 I’ve seen Lemon Syrup cakes made previously and when I tasted it I was amazed at how moist it was. It wasn’t very light, it’s actually quite dense as a cake but because of the syrup that oozes through the cake it changes how everything tastes. Yes, lemons can do this. 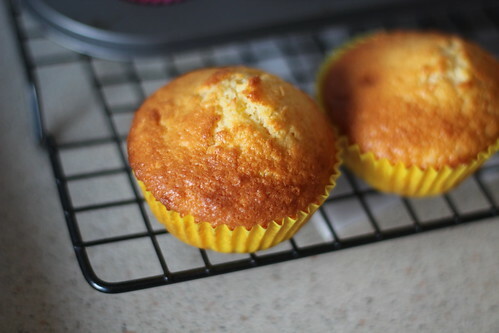 There were plentiful of recipes out there for Lemon Syrup Cakes but none for cupcakes. Of course cupcakes are just mini cakes but I wasn’t sure of how many cupcakes one batch would make. Alas, I just tried one cake recipe and I made a mix of mini cupcakes and small cupcakes, not those normal sized cupcakes you commonly see. I found a recipe by Donna Hay, I was hesitant to try it at first because she only knows how to make things look nice to sell magazines and books. However as it turned out, it was a delight. Check out the recipe and my impressions below! 1. Preheat oven to 180°C (355ºF). 2. 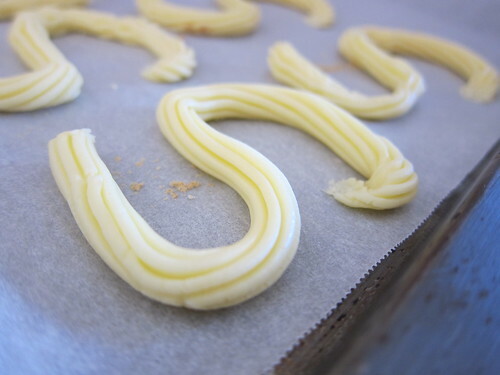 Beat the butter, sugar and lemon rind in an electric mixer until light and creamy. Add the eggs and beat well. 3. Mix through the coconut, flour and milk with a wooden spoon until smooth. 4. 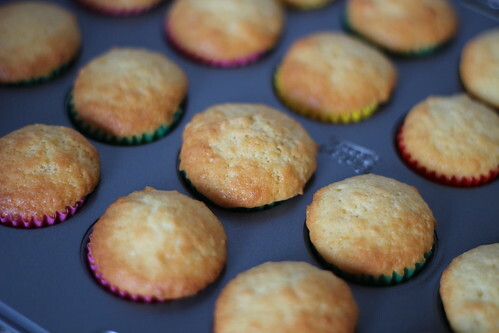 Place muffin/cupcake paper into the pans. Pour mixture into pans and bake for 25-35 minutes or until cooked when tested with a skewer. Leave to cool. 5. 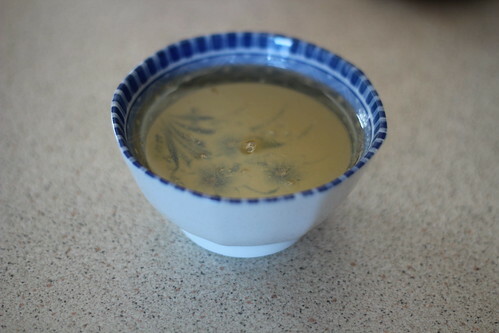 To make the lemon syrup, combine the sugar, water and lemon juice in a saucepan over medium heat and stir until dissolved. If you like your syrup to be more “lemony” keep adding tablespoons full of juice until you get your desired flavour. I basically used a whole lemon’s juice but some may prefer just a touch of it. 6. Simmer for 5 minutes or until thickened slightly and sticky. Pour over warm or cool cake. 7. 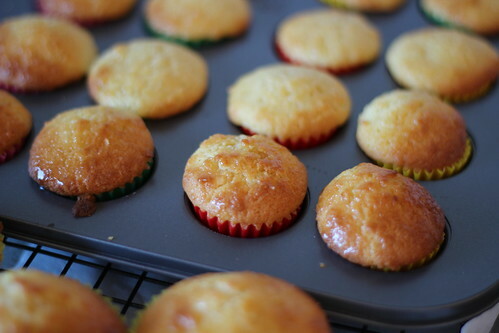 If pouring is too difficult or slides off (top of cakes may be too crispy), use a brush instead and gently tab over it until it soaks in slightly. This recipe is quite easy to make. I had a slight hiccup when the batter looked all kinds of wrong, with the batter separating from the butter. I’m not sure if it was the acidic nature of the lemon rind or not or if I beat the mixture too long but it turned out reasonably well so maybe it was all for the best! The coconut in the cake gives it such a pleasant texture and bite to it, we used coconut flakes which are chunkier than desiccated coconut but it was still good. If you reduce the sugar in the lemon syrup as I did you can either reduce the water too or just wait it out and simmer it for longer. I mistakenly poured in the entire 185 mls when I halved the sugar to 100g but it just meant it took a bit longer for it to get thick. Since my cakes were crispy on top, the syrup just slid right off if you tried pouring it on top. Instead a brush works wonders and can the cake seems to actually absorb more of the syrup. The syrup gives the cupcakes this amazing gloss, I loved it. I was so pleased with the end result, packed full of lemon flavour. Not too sweet, just right. Would definitely make it again. Good job Donna Hay. Straits Cafe near Knox is a popular Malaysian eatery, mostly known for it’s tasty Char Kway Teoh and overall good food. It’s extremely difficult to get tables during the weekend as the place doesn’t cater to many people (space is small) and well, people just enjoy going there to dine. Sometimes Straits has specials on posted at the back whether it be main dishes or entrees. We ordered their Friend Chicken with Sambal seasoning. It was served fresh and straight from the fryer and was quite tasty. The skin was crisp and crunchy, and the chicken was cooked well. I couldn’t really taste the, I presume, spicy seasoning but for Malaysian Fried Chicken it was tasty nonetheless. I believe they are quite well known for their Char Kway Teoh because of it’s authentic Malaysian flavour and one of the more spicy offerings around. There is just something I can’t really put my finger on it, that gives it that extra hit. It’s that special “wok” flavour but it’s so vague and indescribable that it’s best not to talk about that any further. You really are hard pressed to find a Char Kway Teoh as flavourful, spicy and overall tasty as this. I’d say Claypot King in Glen Waverley had nearly or even just as good of a offering as Straits but they no longer operate so the crown goes to Straits. 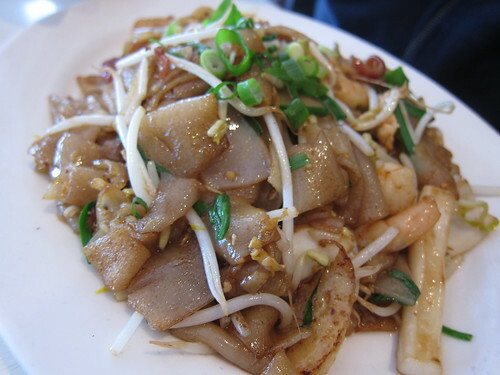 Their Char Hor Fun has stir fried hor fun noodles which are always a delight. The egg sauce is delicious, and I believe they put in the deep fried diced lard but I can’t be certain. Everything here was tasty, the seafood and chicken cooked nicely, and a good serve of vegetables. My only criticism, even if, ever so slight, is that they put the preserved (vinegar) chopped green chillies on the plate as well. So if you don’t like your sauce a tad sour, it can make the sauce kinda strange as somehow the chilli flavour spreads throughout the whole sauce. Again, nothing to make a fuss about, but it may not be to people’s likings. 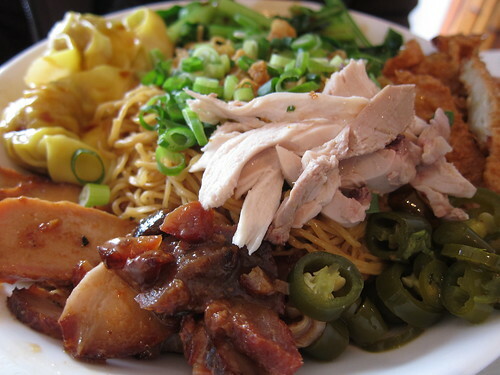 One of their main specials was the Tok Tok Mee, which is apparently Penang Style. 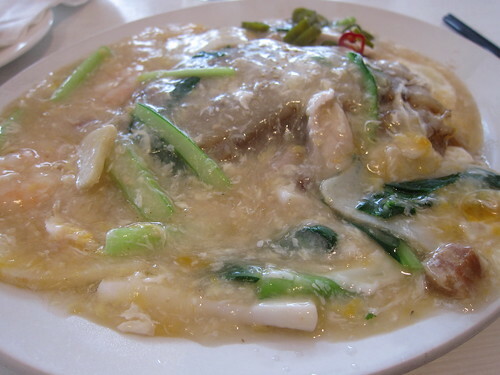 I can’t vouch for that as I have never tried it in Penang but this dish sure looked delicious. It had a wide selection of toppings from the steamed chicken, char siu pork, crumbed chicken, boiled wontons and vegetables. It really had it all. 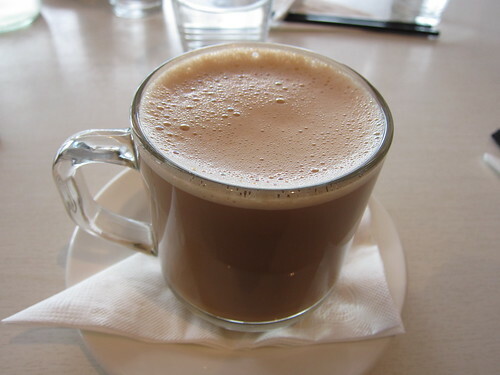 Straits’ Teh Tarik was a slight letdown as it was overly sweet and lacked the pulling tea flavour. It also wasn’t frothy enough but still may please some people. For a sweet warm dessert, Pulut Hitam hits the spot. My mother does an excellent Pulut Hitam, that is much less sweet and actually tastes better as a result (Go figure) but for a restaurant offering, it’s quite nice. 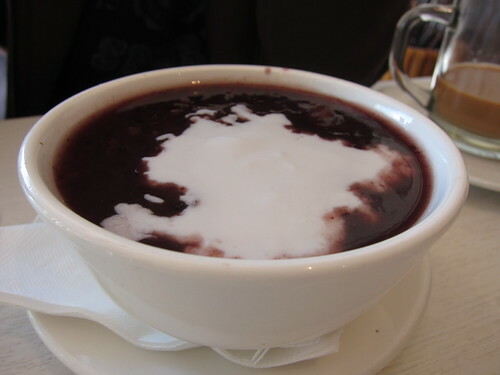 It has those black sticky rice that give it that added texture and the coconut cream provides the creaminess that is much required. Overall, it’s a pretty good Pulut Hitam as many places don’t offer it, although slightly too sweet for my tastes but maybe I’m just spoilt with my mother’s delicious cooking. 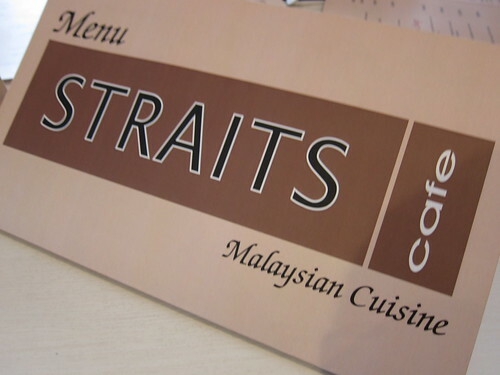 Straits Cafe offers a good variety of Malaysian dishes and most of them do hit the spot. 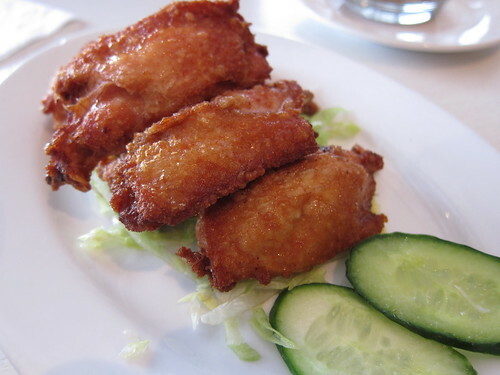 The authentic Malaysian flavours is what people come back for and you can certainly see why. On weekends it was definitely is preferable to book ahead as without a reservation you may be waiting for quite some time. Fumi Japanese Cafe in somewhat a new restaurant in Chadstone Shopping Centre. 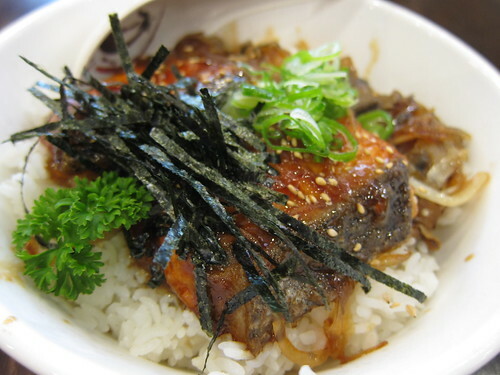 It replaced the Seafood and Chips shop near Aldi and Sushi Sushi. Previously their food was decent, nothing overly exciting but their grilled salmon, salad and chips were large and reasonably tasty. Although like most places, salt ladened. 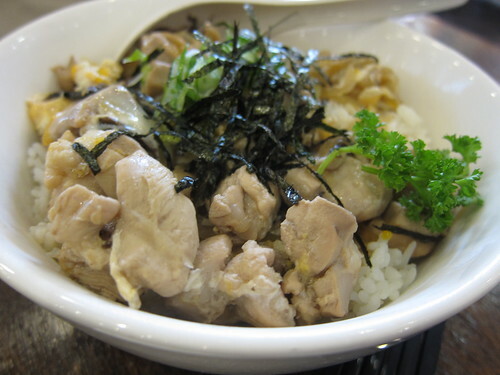 There is quite a large variety of dishes at Fumi, from hot and cold noodles, rice dishes and soups. As shown above we ordered the Salmon Teriyaki, which was decent. The salmon was cooked well, still pink inside. The sauce was as you would find in the standard Japanese food court places. 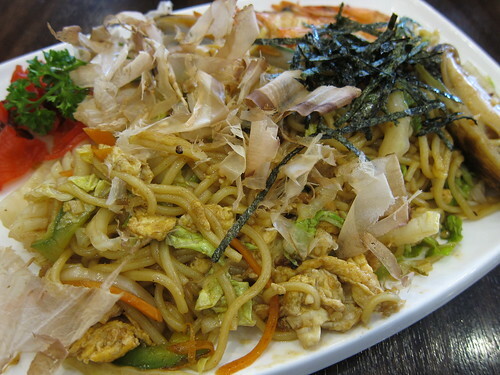 One of things you hardly find in Japanese restaurants is Yakisoba. Fumi’s Yakisoba, wasn’t what I expected though. I never thought it be so green tinted? I usually find them to be darker and slightly brown in colour but taste should be the deciding factor. Fumi Japanese Cafe attempts to tackle the many Japanese dishes known and unknown to most, however on almost all occasions comes out short. I’d like to say this was a wondrous experience with amazing dishes, but it just wasn’t the case. Once a year, in late January or early February, Chinese New Year comes along celebrating the next animal. Chinese New Year isn’t as extravagant in Australia but in recent years, the festivals in the Chinese dominated suburbs have gotten larger and larger. I have never experienced an “authentic” CNY in Malaysia, where my parents were born, but they have certainly tried to bring their Malaysian/Chinese culture to Australia. One of the things I love doing is making treats and snacks to celebrate CNY and one of the tastiest treats is the Dragon Cookies. These cookies are so light, it should practically melt in your mouth as soon as you put it in there! It should be crispy and easy to break. It has such a pleasant, slightly buttery flavour but I can’t really describe it. All I know is, it tastes good. 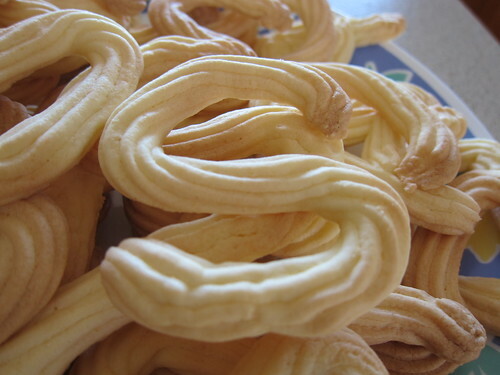 Check out the recipe from Home-made Cakes & Pastries – The Best of Patsie Cheong, it’s so easy to make! 1. Place the softened butter, icing sugar and eggs (yolks and white) in a bowl. 2. Beat until creamy and light. 3. Slowly stir in the sifted cornflour, milk powder, plain flour and then stir in the vanilla essence. 4. 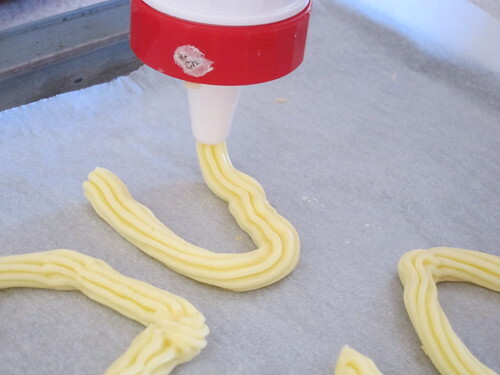 Put it in a piping bag and press out the pattern. This mixture can get quite soft if it’s humid, so it’s best to do this part quickly. 5. Put in oven, bake at 150C for 15 mins or until hard all the way through. (Should come out light yellow in colour) Leave to cool. 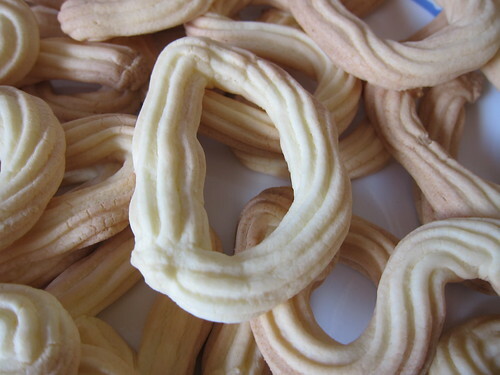 This is a really simple recipe, but the “Dragon Cookies” can be easily to overcook if you don’t keep watch of them in the oven. As you can see, a few of mine are a tad too golden brown. However, they still taste good, it’s just doesn’t melt in your mouth as well. I have made this every year for the past couple years, and if you have kids it’s great fun for them to pipe and try different shapes, letters, or anything you can think of. Le Petit Gateau is still my go to dessert place. Sadly, now that I’m working, it’s challenging to make a trip down there since they close at 5pm on weekdays, and unfortunately don’t open on weekends. However, it’s most definitely worth the time and effort to make your way here. 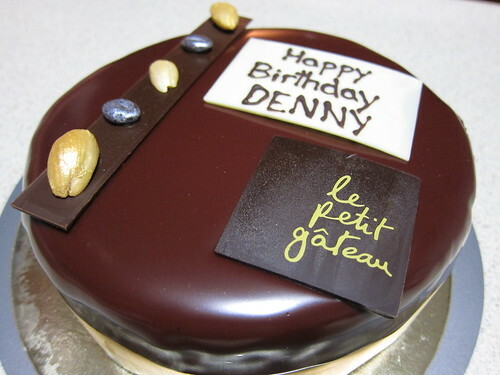 My first encounter with Le Petit Gateau’s cakes was when my sister bought one to celebrate my mother’s birthday. She has this undying love for the combination of nuts and chocolate. Just like me! I was so amazed that there was even a cake that had the flavour of Hazelnuts. This Hazelnut Praline Mud Cake was made for us choc+nut lovers. The mud cake has that nice dense texture, with I believe a sprinkling of thinly chopped nuts through the cake. Although it may be rich, it is certainly delectable. What makes this cake so beautiful is that silky smooth chocolate icing layer around the cake. Glossy, and it just melts in your mouth. It has such a pleasant hazelnut flavour, that it’s like you’re eating the filling of a Ferrero Rocher again and again, but only better. Absolutely delicious. The chocolate strip on top is tempered to perfection, with that nice snap when you break it. Those candied almonds and chocolate bits just are the icing on the iced chocolate mud cake. It even tasted better when I was greeted with the cake on my own birthday months ago! Happy Birthday to me! 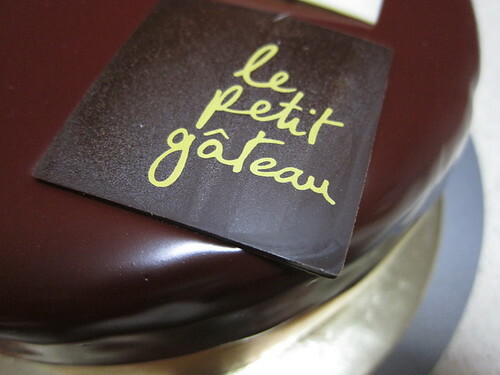 Everyone must at least make a trip to Le Petit Gateau at least once. Their selection of petit (Hehe) cakes will make you salivate. If cakes aren’t your thing, but macarons are? This is the place to visit. I’m not certain if I have mentioned this but their macarons are amazing. One of the best macarons I’ve ever come across in Victoria. Their macaron flavours constantly change, but for those that like a bit of Green Tea, their Green Tea flavoured macarons are delicious. Crisp outer layer, not too airy, and just the right amount of chewiness. Even just thinking about it, makes me want to go before work (when the shop opens at 7:30am) or taking up my whole lunch hour just to get there and back! To be honest, it would be well worth it.